We recently had the opportunity through the Schoolhouse Review Crew to try out some items from A Journey Through Learning. We received three lapbooks and one unit study. We received them as downloads - printed them out, got some manila folders & other materials, and then got to work. 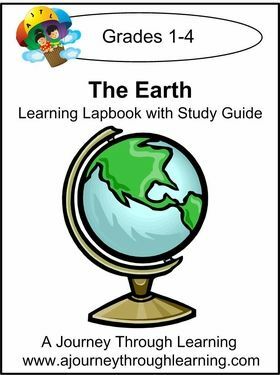 We chose to first try out The Earth lapbook, which is recommended for grades 1-4. In the picture below you can see the kids putting together our lapbook cover. Although Ellie isn't technically in the age range, she likes to be involved so I printed out additional pages & let her scribble & cut to her heart's content. In this lapbook we learned all kinds of things about the Earth and it's spheres, landforms, the atmosphere, oceans etc. There are step-by-step instructions included in case you've never made a lapbook or don't understand how it works. I read aloud the passages and text included in the study guide while Zeke worked on coloring, cutting, and pasting. These are so very good to do with a child who is hands-on, who needs something to occupy their hands while listening, or who is a more visual learner. We also pulled out our atlas and used it alongside the lapbook as it has a special section on landforms (with lots of pictures) that went really well with that particular section in the lapbook. A Journey Through Learning offers a variety of different lapbooks and unit studies. The lapbook we did (The Earth) can be bought in print for $21 or as a download for $13. Click the button below to see other Crew Member's reviews of this lapbook and others.